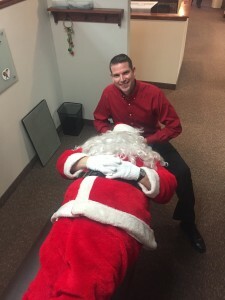 As busy as Santa is before Christmas, he still finds it important to visit the Chiropractor. Each year Santa schedules a Pre- Christmas spinal check-up. 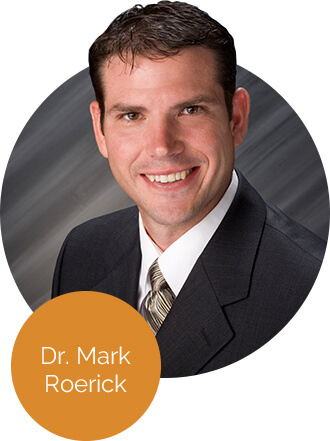 He enters Dr. Mark’s office cheerfully playing Jingle Bells on his Harmonica bringing Christmas spirit to the office and everyone here. 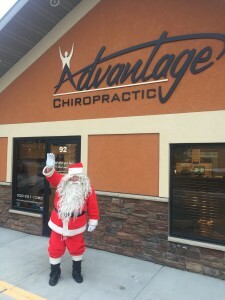 During Santa’s visit, he said, “If you think about all the bags of gifts and toys I carry going from house to house, it just makes sense to get my spine checked before I go to work delivery toys to all the girls and boys”. As quick as he came, Santa leaves with a big smile and a Ho, Ho, Ho. “It is very humbling to take care of Santa, he has a BIG job to do and I feel grateful for the opportunity to do a small part to help bring joy around the world”. Have a Merry Christmas and Happy Holidays from all of us!